Provide comfort for the family of Mary Matranga with a meaningful gesture of sympathy. 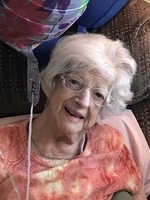 Mary Frances Matranga, 91 of North Adams, MA died Sunday April 14, 2019 at Berkshire Medical Center. She was born in North Adams, MA on June 3, 1927 daughter of Angelo and Rosina (Guidera) Matranga. She attended North Adams schools. Mary worked at Sprague Electric Co. for many years until her retirement. She was a communicant of St. Anthony of Padua Church. Mary enjoyed drawing, cooking and flower gardening. She was a caregiver to her parents for many years. Survivors include her nieces and nephews including Norman (Roslyn) St. Pierre, Dennis (Barbara) St. Pierre, David (Patricia) St. Pierre, Genevieve (Charles) O'Neill and Annette (Steven) Guerino: her cousin Madeline Cuccia and grandnieces, grandnephews, great grandnieces and great grandnephews. She was predeceased by her nephew Paul St. Pierre and three brothers and two sisters including Antonina St. Pierre, Jennie Matranga, Vito Matranga, Stephen Matranga and Joseph Matranga. FUNERAL NOTICE: A Liturgy of Christian Burial for Mary Matranga will be celebrated Monday April 22, 2019 at 11:00 AM at St. Elizabeth of Hungary Church. Burial will follow in Southview cemetery. A calling hour at FLYNN & DAGNOLI-MONTAGNA HOME FOR FUNERALS CENTRAL CHAPEL, 74 Marshall St. North Adams, MA is Monday from 9:30 to 10:30 AM. Memorial donations may be made to St. Elizabeth of Hungary Church in care of the funeral home. To add to the Book of Memories, please visit www.flynndagnolifuneralhomes.com. To send flowers in memory of Mary Frances Matranga, please visit our Heartfelt Sympathies Store.